Lubrication – for squeaky hinges, stuck deadbolts, seized bike chains, or beard clippers. If it needs some oil, WD40 can do the trick. Rust Penetration – for rusted bolts and nuts, or stuck bolts or spark plugs. Time spent soaking up WD40 can help remove that bolt, and simultaneously remove the frustration you might have otherwise felt had you not used WD40. Cutting Oil – for drilling into or through metal, cutting metal, or tapping and threading metal. If you want a clean cut and you also hope to preserve your cutting or drilling tools, WD40 can help. Rust Resistance – for unfinished metal, files, wrenches, planes, chisels, and other tools. Also good for inhibiting further rust damage on rust spots on your vehicle body panels. It’s true, a light polish in WD40 will keep unfinished metal from forming rust. Leather/Wood Treatment – for your wooden tool handles, baseball bat, work boots, or canvas gear. WD40 serves as a weather protectant and waterproofer for your tools and gear as they face the elements. Adhesive Removal – for sticky residue left behind from tape and adhesives. WD40 will de-sticky the sticky gunk and allow you to wipe it off. Then, remove the oily residue with dish soap and water and you’re as good as new. Sap Removal – for when you park under a tree and get sap splattered all over your vehicle. Use sparingly, and you’ll still find that sap is no match against WD40! Whiteboard Restoration – for when your dry-erase whiteboard seems permanently discolored, and doesn’t seem to erase well anymore. Clean it up with water, and then seal it up again with a squirt of WD40 (a little goes a long way). Crayon and Gum Removal – These come last, because they’re actually untested by me personally. Apparently WD40 is great for removing crayon from walls or gum from carpet. I try to encourage my kids to use crayons and gum carefully. So far, so good, but if there ever is a mishap in these areas, WD40 will be called upon! What else is there to glean from WD40? Well, it is called WD40 because it was concocted successfully on the 40th batch, meaning they made 39 attempts until they found success. The manly lesson here, the virtue of perseverance. 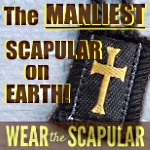 However many attempts it takes, we must be perseverant on our path towards Manly Holiness. 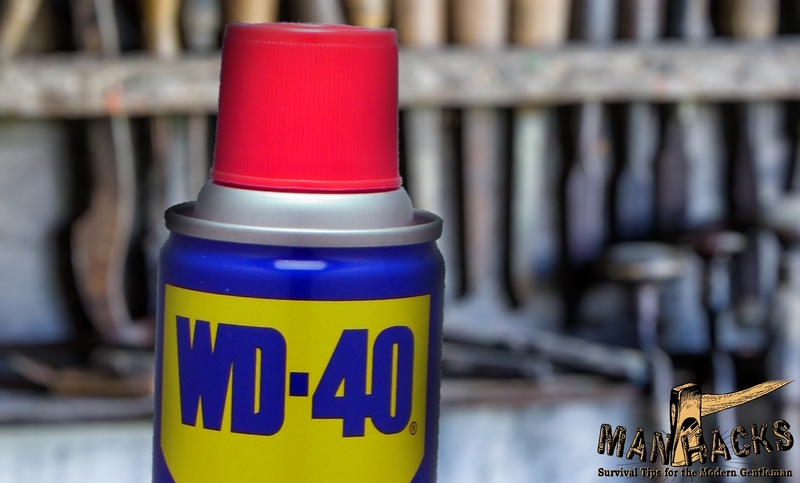 Next, “WD” stands for water displacement, which is why WD40 is so great at lubricating and inhibiting rust. But just remember, there is one effect of water (and the Holy Spirit) that WD40 can never displace, and that is, of course, your Baptism. Third, the number 40 is actually a very manly number. It is a scriptural number that is closely tied to preparation, reconciliation, and journeying closer to God – Noah and 40 days and nights, Moses and the 40 years wandering in the desert, Jesus’ 40 days fast before his ministry, and our current 40 day Lent. So when you use WD40, remember your own preparation and journey towards our Father in Heaven. And lastly, since it’s birth in 1953, the WD40 formula remains a company secret. 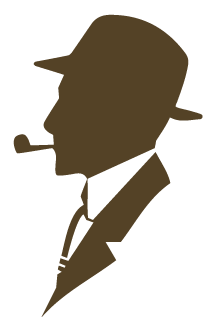 While the chemistry of the concoction that we know as WD40 may forever remain unknown, the ingredients to becoming a Catholic Gentleman are not an unattainable secret. 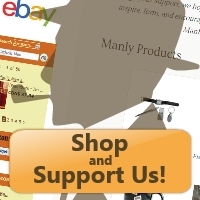 To get the inside scoop on the secret of manhood, simply click here or follow us on social media. As you have seen, WD40 is a perfect item for ManHacking because it can be a very creative solution to a vast array of problems. It is a tool that can inspire your manly ingenuity. It’s also a tool that can make you a humble hero. With WD40, you get the superpower of de-squeaking hinges, removing impossible bolts, and over 2000 other things! What are your thoughts on WD40 and its uses? Be sure to comment below! Oh, and Happy Manhacking! the side of the can. Sure, they have the SmartStraw tip, which is hard to lose. But for those of us without the SmartStraw, the can often outlasts the straw because that darn straw is just so easy to lose. So here’s a very quick ManHack for you! Not too long ago, these fast fill water balloon kits came out with much popularity. I’m sure by now, most of you have tried them out in some fashion. While the water balloon aspect is quick and fun, there is another happiness in store for you that will outlast the pleasure of rifling a water balloon at someone. You know those filler caps that you used on your faucet to fill all those balloons at once? Hang on to one of those and you’ll be indefinitely happy to find a lifetime supply of WD40 straws! Just snip off one at a time as needed and you’ll never be scrounging around for a nozzle straw again! I definitely wouldn’t use WD-40 as a lubricant. If you use it to loosen a part, wipe it off after use and follow-up with a light coat of oil.